Q: Is there a problem with making an entire part of the wall filled with dense gravel and not just the first three courses? A: I would say that this is definitely possible. 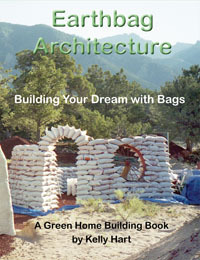 I built a substantial house with bags filled primarily with crushed volcanic stone. This was over a decade ago, and the house is as sound today as when it was built. This crushed stone did pack very well in the bags, so that it didn't tend to change shape, which a slipperier gravel might do, so you might make a test wall before committing to doing this. Filling the bags with loose material does mean that the bag material is being relied on to help hold the shape, so it is very important that the poly material is not compromised by UV...keep the bags covered when possible and plaster them soon! Q: I understand one can build an earthbag structure using only gravel as a fill. How insulating is gravel, if at all? Could you give me a comparison to, say, road base? A: You might get a slight improvement in insulation using gravel as compared to road base because of any air trapped in the spaces between the individual stones (if there weren't any fines in the mix), but I wouldn't expect very much.